In 1969, a small group of citizens of Northeast Brazos County created a water system to meet the needs of the rural area. Now, over 40 years later, the Wickson Creek Special Utility District (WCSUD) supplies water to an area of approximately 750 square miles in portions of Brazos, Grimes and Robertson Counties, serving over 7,000 customers. WCSUD currently has 11 wells, which can produce 5 million gallons of water per day from the Sparta, Simsboro and Yeagua Aquifers. Our main goal is to maintain "Quality On Tap" water and service to our customers. To ensure the highest water quality possible, water testing is regularly administered. 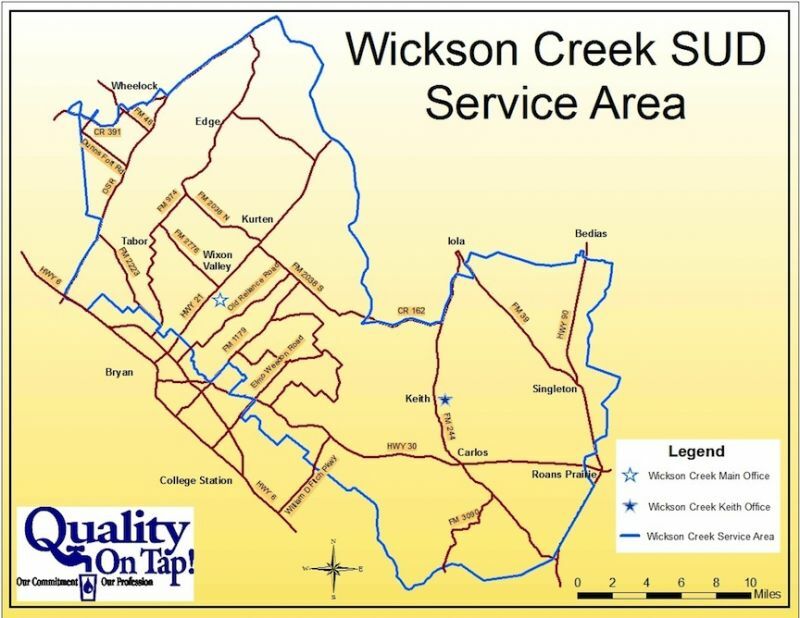 Below is the Wickson Creek SUD Service Area Map. You may also click on the PDF link below to print or zoom.